May 20, 2018 VICTORIA, BC – Victoria Highlanders FC (0-3-0) welcomed Portland Timbers U-23 (1-1-0) to Centennial Stadium, May 20 for their Home Opener. Despite relentless pressure from the home side in the second half, a curling ball off the left wing from Gio Magama-Rivera was the difference as Timbers took the 1-0 win. The Highlanders kicked off their home opener on the front foot, pushing into Portland’s half with bright starts from Marcus Campanile and Cory Bent. Bent and Portland’s Francois Dulysse made for a great matchup throughout the early stages of the first half. On 32-minutes, a shot from Stuart Heath was saved, followed by Hundal in the 37’ turning his defender, but the former UVic Vikes’ attempt on goal was stopped again by Portland ‘keeper Zach Nelson. The two opportunities finished as Victoria’s top chances of the half. Timbers U-23 generated chances of their own as the first half carried on, including a dangerous looking free kick midway through the half. However, a resilient Victoria back line kept the visiting side from any threatening looks on starting ‘keeper Nolan Wirth. The two teams would head into the break in a 0-0 deadlock. The Highlanders took advantage of Portland’s third game of the week as the second half opened, with increased pressure on Portland’s backline. On 58-minutes, Victoria’s Gordon Hall found space behind the backline just missing the net in what looked to be the Highlanders opening goal of the season. The pressure continued to mount as the half continued, with UVic standout Isaac Koch running down the wing and hitting a shot off the woodwork. Koch continued to cause headaches for the Timbers, with multiple shots from the 18-yard box. The game came to a head in the 78th minute, when recently substituted Magama-Rivera found a way past the Highlanders back line to curl an excellent effort past Wirth to make it 1-0. Late in the half, Koch looked destined for a penalty in the 83rd minute after going down inside the box, but no call was made on the play. A late push into the attacking third by Victoria would come up short, as the home side fell 1-0 to open up their home schedule. The Highlanders are back in action this Friday May 25th at Centennial Stadium versus Lane United. Kick Off is at 6:35 PM. 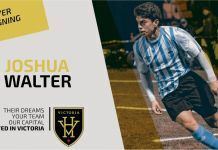 For more tickets and more information, please visit www.highlandersfc.ca.